Mamata Banerjee today asked the Gorkha Janmukti Morcha to refrain from violence and talk to the state government if the party had any problems. 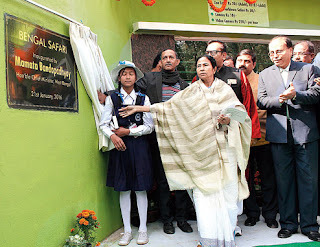 The chief minister made the oblique reference to the hill party at the inauguration of the North Bengal Wild Animals Park on the outskirts of Siliguri.
" Puriye dile hobe na. Kichu bolar thakle bolun. Jaliye deben na (Arson would not do. If you have anything to say, tell us. Don't burn down (things)," said Mamata. The remark came immediately after she had referred to the establishment of various tourism infrastructure in north Bengal and the repair of forest bungalows at Takdah and Jayanti during her regime. According to observers, the chief minister's oblique and short message for the Morcha is in the wake of a snap in the communication between the state government and the GTA. "Earlier, Kalimpong MLA Harka Bahadur Chhetri was the link between Morcha and the state government. Ever since he walked out of the Morcha, the GTA-government communication has virtually stopped at the political level. The chief minister has understood it and proposed the resumption of talks to resolve issues through today's statement. Besides, ahead of the polls, Mamata wants peace in the hills and that is why she referred to the Takdah bungalow arson," said an observer. Mamata said: "We have put in place important infrastructure across north Bengal. The Uttarkanya and Kanyashree (the branch secretariat and the VIP guesthouse on the same premises) have been constructed. Today, we opened this safari park. The Takdah forest bungalow has been built and it was torched earlier. The Jayanti bungalow, which was also gutted in a fire, has been rebuilt." She added: "If anybody has any problem, they should come and speak to us. I would like to tell them that don't set fire to properties." The Takdah bungalow, located around 35km from Darjeeling, where the chief minister had stayed in 2012, was set on fire in August 2013 when the Morcha was enforcing an indefinite strike over the demand of Gorkhaland. The structure was rebuilt at the instruction of the chief minister. In June 2011, the Jayanti bungalow, a 61-year-old structure, was gutted in a fire, which foresters suspected was a sabotage. The bungalow, 35km from Alipurduar, was rebuilt with seven new cottages and inaugurated by Mamata in September last year. Mamata's call for the Morcha to adopt the path of peace came a day after the Trinamul Congress had fumed at the hill party. Trinamul leaders like MP Abhishek Banerjee and minister Arup Biswas told a rally in Mirik yesterday that the Morcha had fooled the people of the hills in previous elections.